Every Fort Knox safe exceeds the standards established by the best known consumer protection organization – Underwriters Laboratory (UL). UL puts our safes through a battery of tests including drilling, punching, prying, hammering, and several tamper tests to insure our quality and your protection. Our fire protection packages are tested at an independent facility and certified to keep the inside of the safe under 350 degrees Fahrenheit. We use UL Listed, fireboard insulation on all 6 sides and insulate behind the hinges to avoid any hot pockets. A high temperature, heat sensitive expanding fire seal expands to seal the safe around the entire door. Here is where a good comparison should come in. Our patented rack & pinion, bank-type locking mechanism is the most technically sophisticated and reliable locking system available. Most of the finer new cars manufactured today use rack & pinion steering because it is a stronger, more precise, positive, and maintenance-free system. We have also added a clutch to the handle to prevent damage from undue force on the handle. 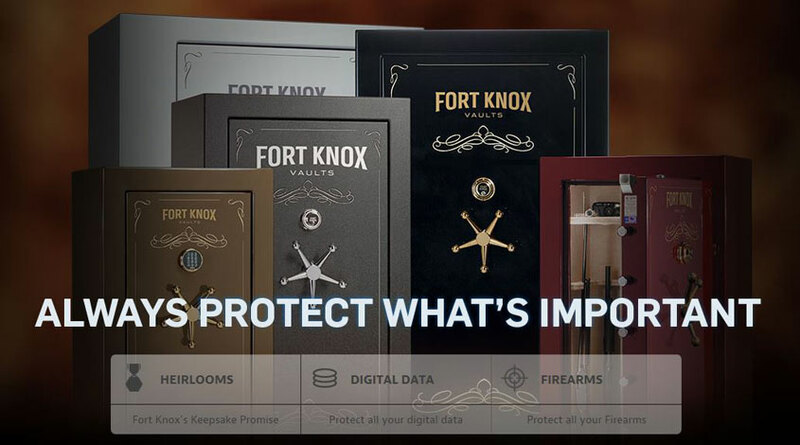 Fort Knox offers the most extensive warranty in the industry. Not only does it cover burglary, burglary attempts, fire, flood and incidental damage, it also covers the lock and paint, two items usually excluded by other manufacturers. So, compare our warranty to the competition – there is a difference! See our written warranty for complete details.